When a child is born with a disability, parents mourn what could have been. They may be in shock and grieving, needing time to adjust. When there are other children in the family, parents may be too involved in their own grief to understand the impact that this unexpected occurrence is having on the other children. Children see the adults grieving and stressed and may not understand what is happening. They too may have been preparing for the birth of their sibling and what may be taking place is not what they expected either. It is important for adults to remember that children need reassurance, an explanation and to know that they are loved and included. This book is written by a Child Development Specialist to assist families in these situations. In My Sister is Special, My Sister Has Down Syndrome, Olivia prepares for the birth of her sister. She practices caring for a baby with her special doll. Her parents have prepared her for her role as a big sister, yet when her sister is born, all is not as Olivia presumed it would be. She is not allowed to help care for her sister. There are no celebrations of her sister’s birth. Her family is sad. Her mother cries a lot. Each time that Olivia asks questions, she is only told to go to play with her doll. As the story concludes Olivia reminds us all of what we should already know. A child is more than a diagnosis. 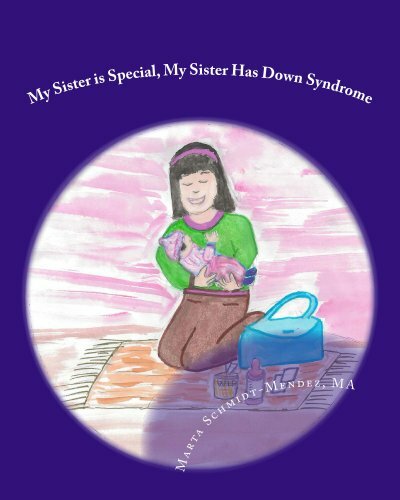 My Sister is Special, My Sister Has Down Syndrome showcases the resiliency of children who can come to a place of acceptance so much sooner than adults.